debbie kay designs: Making Ten! My 1st graders have been LOVING playing Cover Up! It's one of the games included in my Make Ten! 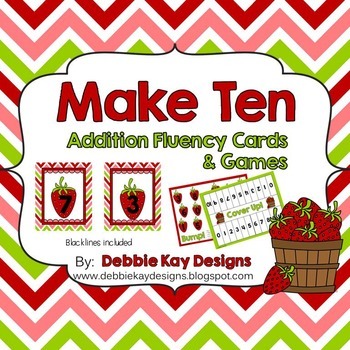 Addition Fluency Cards & Games packet. Students choose a card and then determine the number which needs to be added to it to make ten. Then, they place a marker on their board. Their partner takes a turn and does the same. Play continues until one player has covered up all of the numbers on their board. This game is simple to prep, comes in blackline masters so that you can save on colored ink if you prefer. 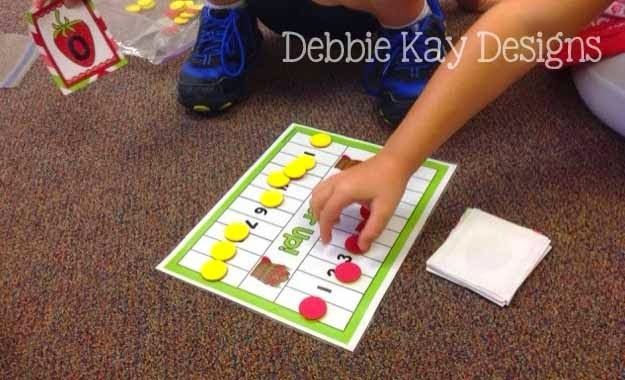 It can be a math center or, as I use it in my class, a "math choice" for early finishers. My kids are loving the little bit of competitiveness a game provides and choose this to play with their math partners over and over again. That's a good thing! To see this game, and other games to practice making ten, click on the link below.